Is Hooping really a good workout? Yes! Hooping burns as many calories as running and, in terms of heart-rate and oxygen consumption it is comparable to a group boot-camp class (read: America Council on Exercise). Hooping also builds functional core strength - so not only does it tone and strengthen core muscles, but it also improves overall stability, posture and balance. The Hoop Play workout is a full-body workout, so you can use the hoop to tone your legs and arms, as well as your core! Moreover, Hoop Play is mindful and holistic exercise - it will challenge your mental stamina and inspire you to feel good from the inside out! What If I Can't Hoop? When hooping gets easier, smaller hoops intensify the cardiovascular workout, while more complex moves can be introduced to build core strength. In group classes, we use a variety of hoops to modify movements! If you are ordering a hoop through our online store and you're sure you can't waist hula-hoop then we recommend a Starter Hoop. Is Hoop Play safe for me? In general, hooping is a safe, low-impact exercise tool for all fitness levels. Hooping puts minimal strain on the joints and, when done correctly (as demonstrated in our online videos, in-person classes/training, and instructor certification) Hoop Play has proven to be safe for older adults, pregnant and new mothers, as well as individuals with non-acute back, hip and knee injuries. For older adults or new/expectant mothers that may be concerned about a heavy hoop, we recommend our Trickster Hoop since it is made with lightweight material. As with any new fitness activity, please discuss your unique situation, questions and concerns with your doctor. Why aren't your hoops weighted? We wouldn't add weight to our stomach in order to make our sit-ups harder, so we don't do it with hoops either! Weighted hoops can actually be dangerous for some users, causing bruising or serious injury/damage when the hoop falls. Moreover, functional core conditioning has greater benefits than simply increasing resistance. In our in-person classes/training and online workout videos, we'll show you simple exercises that focus on balance, stability and improved posture while you are hooping so you get the greatest variety and benefits from your hoop workout! Workout videos are included in The Hoop Play E-Book, which comes with all Bulk Hoops (6-pack & 15-pack)! What size of hoop do I need to start? The bigger the hoop, the easier it is to use for waist-hooping; and the smaller the hoop, the greater the cardiovascular workout. The Trickster and XL Trickster is designed for both on-body/core hooping and off-body hoop tricks! Since the Trickster is smaller, it is more difficult for waist hooping but better for off-body moves. The XL Trickster is ideal for new/expectant moms and those with injuries or physical limitations. Our Kids Hoops are ideal for kids (of course!) but also for advanced hoopers who like a fast hoop and lots of off-body tricks! Why Don't You Have PolyPro? 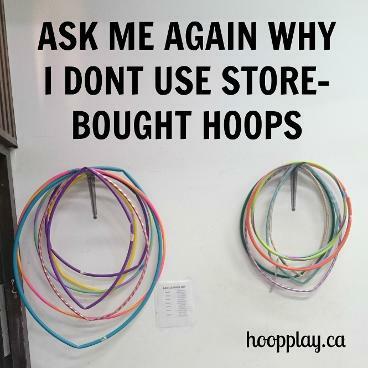 We do not carry PolyPro hoops because we strive to source all of our tubing from Canada, and currently the material is not sold here. Although we occasionally carry PolyPro when we vend/attend festivals, we do not include PolyPro hoops in our online store. After years of experimenting with different materials, we settled on PEX tubing for our advanced hoop tricks. PEX is slightly more flexible than polypro tubing but totally kink-proof! "I was never able to hoop with any hoop except the ones made by Cody at Solstice Hoop Play! I really like how there are different hoops ranging from larger beginner hoops to smaller trick hoops. I have found which hoops works best for the tricks or workout I aim to be doing and I love being able to switch between them all to challenge my core and strength! I find them so helpful in class if a student is having trouble keeping the hoop up around their waist or it's too heavy for the tricks we are doing, it's a simple switch out and helps the students gain the confidence to keep hula hooping and strengthening their skills!" Click Here to go right to our Online Store, or call 306-281-0127!